I lived in Southern California for a total of ten years. My friends in States With Real Winter used to send me hate email in January for posting pictures on my blog of things like barbecue parties on our patio with fat, juicy oranges dangling off of the verdant trees in the background. I love California winter. Winter in California is what I think summer should be. Of course, the moment March rolled around I wilted until November. But now I live where I get many good months of winter and the summers are tolerable (it can still get hot at 8500 feet). We mountain folk are smug little bastards. When I talk to Boulderites I refer to their town as “the flats” and I like to remind them that they don’t even know cold, snow, and especially wind. 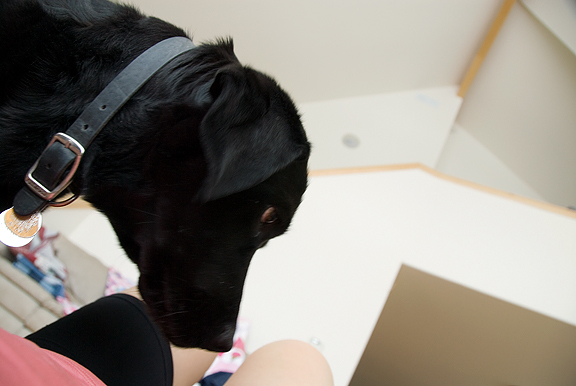 When I regard them from my home, I literally look down at them. Okay, but where the hell is this going? I’m not putting that on a cake. I do love winter, but the monotone colors of snow and dirt can get old around now and we still have 3 more months until mud season. Living ten minutes from a ski hill ain’t bad, except when you get a nice dump of powder and the winds are blowing it straight into bleeping Kansas. 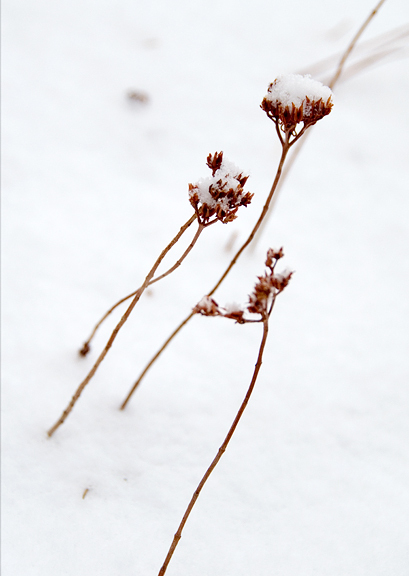 Days like that – days like today, I stay indoors and get my cardio burn going. I rowed and rode for 2 hours. Kaweah sleeps the entire time, until I do my ab work. Lying on the floor is an open invitation to play. There’s nothing quite like Mexican food with a kick for a wintry day. Seeing as we are in Colorado, you can’t find serious Mexican food anywhere. You have to go south to New Mexico to get it – or you can make it yourself. In my home state of Virginia, Mexican food was relegated to the likes of Chi Chi’s or Taco Hell Bell. [I still have a soft spot for Taco Bell… cheaper than dog food.] Living in So Cal exposed me to some excellent Mexican food, including a favorite dive in East LA where we ran the risk of being gun fodder in random drive-by shootings every time we ate there. It was so worth it. But the real education was living with Jeremy, a native son of New Mexico. Despite the fact that he’s a white boy, he has discerning tastes when it comes to New Mexican fare. He taught me to make enchiladas, stacked enchiladas. I know, we have friggin’ orange cheese in the photo. When we grocery shop, it’s a search and destroy mission. I take the items that require assessment of freshness or banter with the butcher. Jeremy is assigned the items that couldn’t possibly get screwed up. In and out and nobody gets hurt, see? Except this time I just said, “cheddar”. I forgot to add, “organic and not friggin’ orange”. My bad. We sometimes make stacked chicken enchiladas with shredded chicken, but this time I wanted something with spank. I used shredded carne adovada. Pork rules. 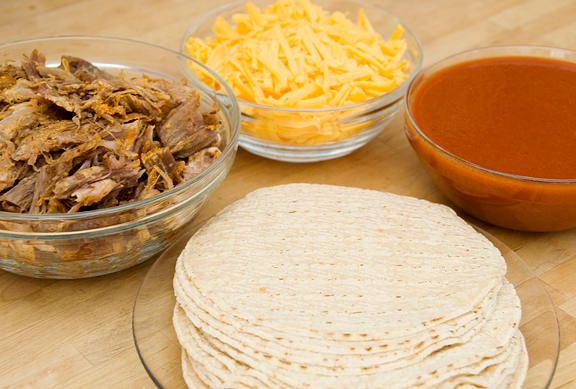 After the initial spoonful of sauce at the bottom of the baking dish, start stacking tortillas, meat, cheese, and drizzle sauce. Repeat about three or four more times. I like lots of layers, just like my cakes. 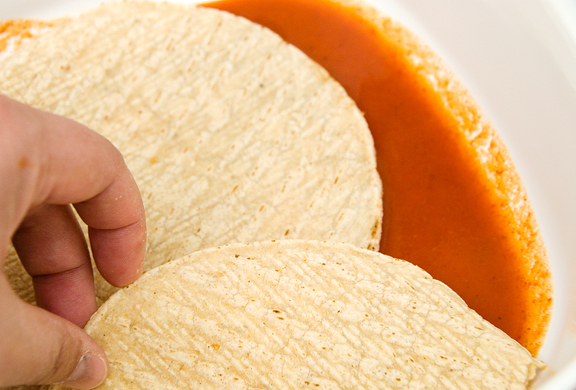 You should end with a layer of tortillas, some cheese, and enough sauce to cover them. The top layer tends to dry out during baking, so I typically bake it uncovered for half of the cook time and pop a lid or foil over it for the remaining half. If you try to serve this straight out of the oven, it tends to ooze into a pile that looks suspiciously like vomit. I like to let it set up for an hour or overnight and reheat the servings. 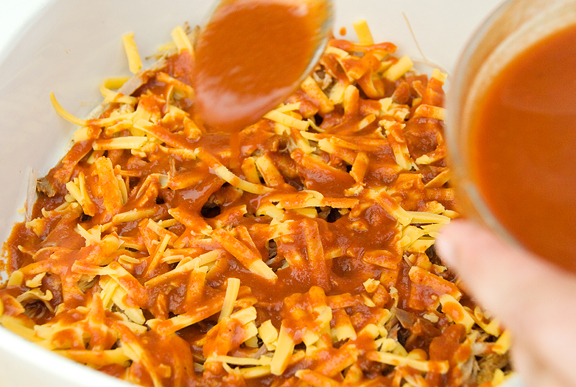 In an 8×8-inch baking dish, put two or three spoonfuls of enchilada sauce in the bottom and spread evenly. Layer with three overlapping tortillas. Sprinkle 1/3 of the chicken meat evenly on the corn tortillas. Sprinkle 1/4 of the shredded cheese. Spoon 1/4 of enchilada sauce. Repeat for two more layers. When you top with the last three tortillas, sprinkle remaining cheese and pour remaining sauce. Bake at 400°F for 40 minutes. You may want to cover the dish for the last 20 minutes if the top starts to dry out. Wow!! Enchiladas are my favorite mexican food! Each time I go to a Mexican restaurant, I know I should order something new to mix it up, but I can’t help but order one each time. Maybe if I get more of it at home I won’t have the craving anymore. its like a mexican lasagna! ain’t nothing wrong with that. although in california, you might as well go out and get some damn good mexican home cooking instead of making it yourself. When I saw the photos I though you made a lasagna … it is not, but it is as well. Would be a lovely recipe to use to delight and also confuse my friends (since they would think it i a lasagna due to my origins). Yum. That looks yummy! I agree – it looks like a mexican lasagna. OMG, that looks soooooo yummy! I love Tex-Mex food and this dish makes me drool! i’m looking forward to the day when i can devour some authentic tex-mex food. i love virginia, but you’re right–her mexican-type offerings are sorely lacking. What a great idea, never seen it stacked before. I think I’d probably prefer this to rolled. hey! I’m really enjoying your posts…just thought I’d share that with you! Love the idea. It looks delicious. Please don’t worry so much about orange vs white cheese. I know some people do, but truly, it is only a flavorless food coloring. It has nothing to do with the flavor of the cheese. If it tastes good, it’s good! I’d like to hear more about why folks carry this unfortunate prejudice so passionately. I’m from Wisconsin, but I live in a neighboring state and make my living selling cheese. I think we would be better served by a conversation about type of milk, type of cheese, flavor, meltability, texture, etc, than worrying about color. Stacked enchiladas! I thought ours was the only family that still did these! We use a recipe that has been handed down from generation to generation and appears to have originated in way-southern Texas before the Civil War. We add black olives and chopped red onions. Yum! Looks awesome! This would definitely be a hit at my Chez SGCC! I’m going to take your advice and make the Carne Adovada too. The husband’s birthday is on Cinco de Mayo and I’m already planning the feast. I usually stack my enchiladas too, but I do not have the patience to wait until the next day to eat them! I think i may be making enchiladas soon. Thanks for the inspiration. 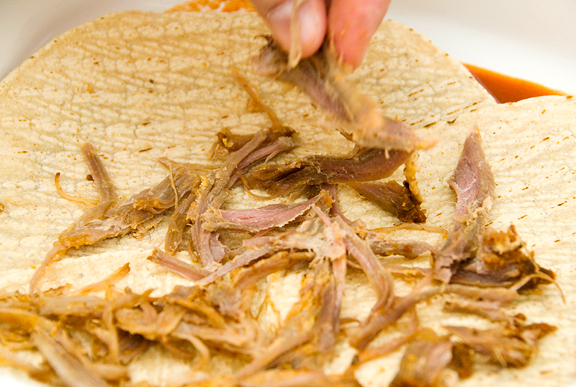 I’m scared – My mouth is producing saliva at an alarming rate looking at that shredded Pork. Shredded Pork…Shredded Pork. I even love saying it! Jen, don’t post things like this, unless you’re willing to chill-post them across this side of the Planet. Delicious post! Do you have an enchilada sauce recipe? Or Brand to suggest? Oh, man. I am so BUSTED! You now know that I made cupcakes with canola oil instead of butter. Seriously, I’ll try melted butter next time, but this time I was in a ridiculous hurry between baking, frosting, driving this person here, dashing there. And I would trade you your fresh powder for my flowers and hair-arranging birds any day! But I’ll let you keep your mud season. I guess it wouldn’t make you feel any better to know that as I was whizzing down the hill to work this morning on my motor scooter, I though that the cool air on my bare legs felt pretty good. No? I didn’t think so. Sorry. The enchilada recipe is very timely. There is a pork shoulder that stares me right in the eye every time I opened my freezer. It wants to be roasted overnight in a low-temp. oven. I may let it out this weekend. These look fabulous! 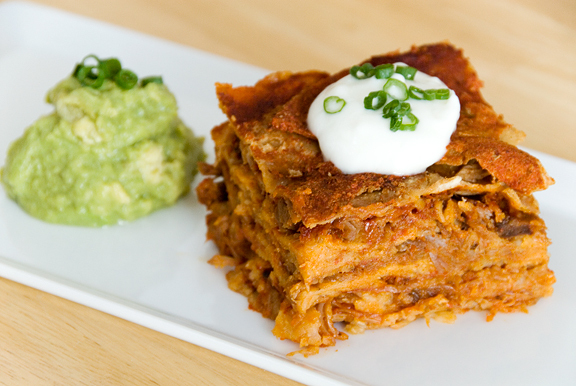 I’m a huge fan of enchiladas, and this stacked variation is a great twist. We live in Chicago, in a neighborhood where good Mexican food is plentiful. Still, we’ll occasionally hit Taco Bell as a fast, cheap change of pace. Old habits die hard. It’s lunch time.. and I’m STARVING!! Man.. what I would do for a leftover slice of that! Sometimes I like things like this SOO much better the following day.. This looks pretty good and easy to make. I promise I won’t go into detail about the awesome weather here in California right now! Yeah, my understanding is that the stuff that makes yellow cheddar yellow is perfectly natural. Gotta love mountain snobs. When I moved from Albuquerque to South Bend, IN, it was hard not to make fun of the midwesterners. Oooh clever! That looks awesome! That looks simple and tasty. Great idea to stack them! Oh, hell. I realized after I wrote that last comment that you probably don’t need anyone to fix your hair these days. Look, I’ve got tons of hair–more than anyone needs–and I’ll send some of it over if you want. Now that is they way to go…I hate rolling those things. Rosa – me too! love it! Steamy Kitchen – thanks, woman! Elizabeth – it’s not a worry, it’s a preference. There’s no reason for it to be colored. Delaney – woohoo!! looks like you have a fancier version and it sounds great! Susan – pork lovers rejoice in carne adovada :) I hope he likes it. What a great date to have a birthday too! I’ll grab my party hat and be right over, sweetie! Chelsea – yay, another stacker! Graeme – honey, had I known I’d have shipped some on ice to you. I still want you to pour milk into that bowler. JMc – Admittedly I’m a lazy bum and I buy a brand that has more Spanish than English on the label. I do have recipes for homemade in several of my books, but I can’t bring myself to use up my chili powder because I like to save it for cooking meats :) If you still want one, email me and I’ll dig a few up from the good books! Cindy – you know, the title of my blog is not a directive so much as a statement on life. So it’s okay that you used canola, although if you ever use margarine in place of butter I’ll just pitch a hissy right on your blog ;) The mud season isn’t so bad. 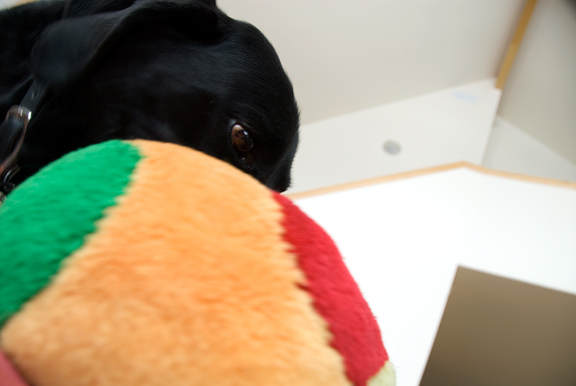 The worst part is doing anything with the dog outside… filthy thing. Go forth and make carne adovada! Terry – ha ha, I sooo know what you mean about the Taco Bell. I have a Bullwinkle shirt that I got for buying 40 tacos (granted, I used to drive a carload of volleyball teammates with me to get to the 40 faster). Kevin – very simple indeed, which is why I love it! I made chicken enchiladas once and found them to be more work than I imagined. I will remember to try stacking them from now on. I love the avocado mound on the side! Mexican food to soothe all woes. Stacked Mexican food to soothe all woes in greater quantity. Mmmmmmm. Bridget – bummer. But there are good eats in Philly to be found, for sure! I would so brave a blizzard to come knock on your door for a plate of this!! Absolutely the bomb…that pork rules!! When I do my Pilates series at the house, my dog thinks the same: open invitation to lie on me, roll against me, bring me his toy or just play jumps every time I do leg switches! Wow. I was just checking your blog tonight after dinner, only to find this entry. I needed comfort food for dinner this evening, so what did I make? Stacked enchiladas with homemade enchilada sauce. I’m a native New Mexican, too, and when I need a pick-me-up, I make NM food. The flavor is so unique, not like anywhere else. One of my favorite Albuquerque restaurants used to serve this with a fried egg on top — that is heaven to me! Thanks for sharing. Making this tonight and can’t wait. I decided to make a quick batch of pickled red onions, thinly sliced, to go on the side. Spicy shredded pork + pickled red onions = YUM! Nate – oooh, that sounds great. Hope it was a hit for ya! Wow! Simple, easy and delicious! I LOL at Chi Chi’s and Taco Bell! I don’t know if Chi Chi’s is around anymore (we have a La Tolateca and a La Tonalteca in town, no Chi Chi’s) and Taco Bell is at the beach. I spent many of my college years at Chi Chi’s used to love the Fried Ice Cream! Thanks! Katie – yes, they really taste awesome with an extra day. You’re so welcome! Another great recipe! Try throwing a fried egg on top after the enchiladas finish baking!!! Quintan – sounds great (I love fried eggs)! I love your blog – the photos and recipes are excellent! I know maybe somebody already asked – what kind of camera do you use?